We are Europe’s largest taxidermy company and buy big. It offers good discounts on the materials. These discounts are passed on to our customers. We have everything under one roof and thereby minimize our logistics costs. Our 20 taxidermists have many years of experience in specialized work processes. It minimizes waste time. Our IT system supports the entire production process, and therefore we do not spend unnecessary time on resource-demanding manual follow-ups. Our customers can log in directly to our web production portal and follow the process of the work from start to finish. The price is based on ordering the mounting online. Hereby you do part of the work yourself, and we save time on manual entry of the order. The fine print: The offer is valid for roebucks that are handed in / sent to our address during the period from 1 April – 1 September 2019. The price EURO 200 + VAT applies to the first 300 orders, we receive. Max. 2 mounts per customer at this price. After that the price is 340 EURO + VAT. If you need a skin for mounting (maybe you have a nice roebuck / your first roebuck on a wooden plate on the wall), we can supply a new summer skin for the mounting. And if you belive in yourself, you can order the mounting before you have shot the roebuck. And should you fail to shoot the roebuck this year, we will issue a gift card that is valid for 3 years. I hereby order a shoulder mount for wall, 200 EURO + VAT I hereby order a shoulder mounting as freestanding pedestal, 400 EURO + VAT (incl. pedestal in oak. Color card for pedestal is provided when ordering.) I only have the skull, but lack a summer skin for the mounting, which is supplied by First Class Trophy. Price for skins is 120 EURO + VAT I haven’t shot the roebuck yet, but would like to order and pay the deposit of 50%. A gift certificate of paid deposit is issued for 3 years on deposit if the roebuck is not shot. 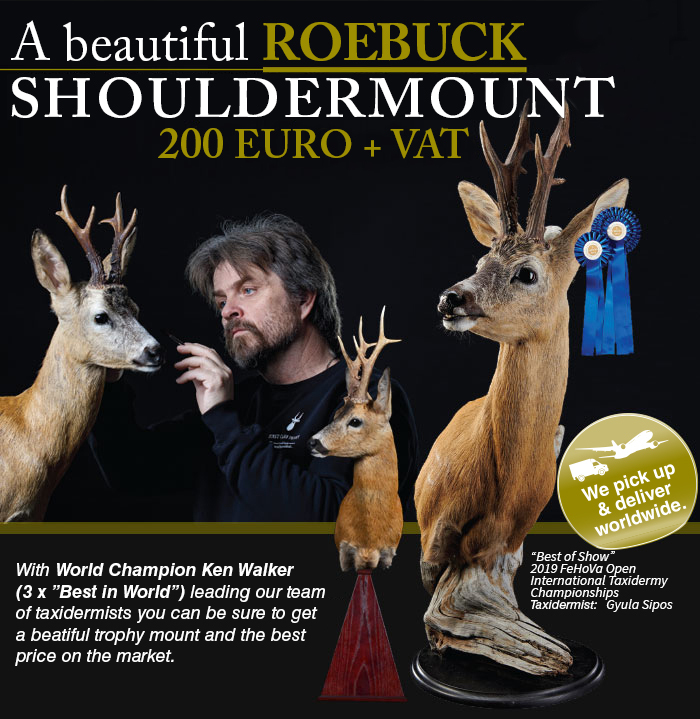 The roebuck must be sent to / handed in at our address in Denmark or in Germany and picked up here when the trophy is ready. But if you wish, we can offer both pick-up service and delivery service. Once we have received your order, we will send your order confirmation per. mail with all information and info.